Traditionally, winter time is a slow period in the real estate market. However, it still makes good dollars and sense to purchase a property during the winter. 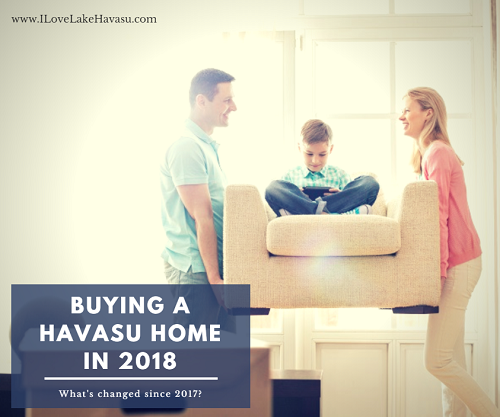 Even though we’re only a couple of weeks into the new year, buying a Havasu home in 2018 is already a little different than what it was last year. A new tax code and buyer competition are just a couple of things to look out for. Find out what else awaits you in the Havasu real estate market throughout this upcoming year. The first thing about buying a Havasu home in 2018 that you should be aware of is the new tax code. Just before the end of 2017, President Trump signed a new tax bill into law. Lots of speculation was made about how this will affect homeowners in 2018. One of the biggest questions had to do with the mortgage interest deduction. This has been lowered to $750,000. However, for most Lake Havasu homeowners, this won’t be a factor. And it definitely shouldn’t stop you from buying a Havasu home in 2018. Another part of the new tax bill increases the standard mortgage deduction to $24,000 for married filers and $12,000 for individuals. For this, talk to your tax advisor. You may still want to itemize to get a better deduction. Total sales increased almost 25% last year (compared to total sales in 2016). Prices, on the other hand, increased just 2.9%. While higher than 2016, the rise in prices has begun to slow down a little. Mortgage interest rates continue to creep up. Currently, they hover right above 4%. Many financial experts believe we could see them hit 5% by the end of 2018. This makes buying a Havasu home in 2018 much more attractive. Expect more competition from other buyers. Savvy home sellers stage their properties to highlight their best features while hiding their flaws. When buying a Havasu home in 2018, you’ll need to look past the flash of home staging to make sure you don’t overlook serious issues. Yes, the bathroom feels like a spa. And those new light fixtures are fantastic. And what about that beautiful paint color on the walls?! They’re all great. But you don’t want to have to replace bad plumbing or wiring after you move in because you didn’t notice these problems before you purchased the property. And don’t let the pretty paint colors distract you from potential mold issues. Take a close look at everything. Lift the rugs. Move the furniture or pictures on the wall to take a peek behind them. And don’t forget to look underneath the sinks to check for possible problems. When buying a home, being a “snoop” is not a bad thing. Finally, one of the other things to watch out for when buying a Havasu home in 2018 is any red flags online. So many buyers begin their home searches online nowadays. Unfortunately, this might leave you open to identity thieves. They get more and more clever as technology advances. Watch out for offers that sound too good to be true (super low price available for just a day or two). Never give out your social security number to any online search agency. They don’t need it. And “out of the country” sellers could be someone looking to steal your information. It’s always best to discuss any listings with your Lake Havasu REALTOR@ first. Let them contact the seller on your behalf. That’s their job. « What’s Included in My Havasu Home Disclosure Form?